With more than 8,500 square feet of gym space overlooking the Chao Phraya River through the 11 floor-to-ceiling bay windows, Shangri-La Hotel, Bangkok’s Health Club offers over 50 state-of-the-art fitness facilities and advanced technology sprung floors for utmost safety and comfort. The equipment includes 18 cardio and 17 strength machines plus free weights, vibration training, Muay Thai workout accessories, suspension training system, group fitness workout implements and stretching stations. 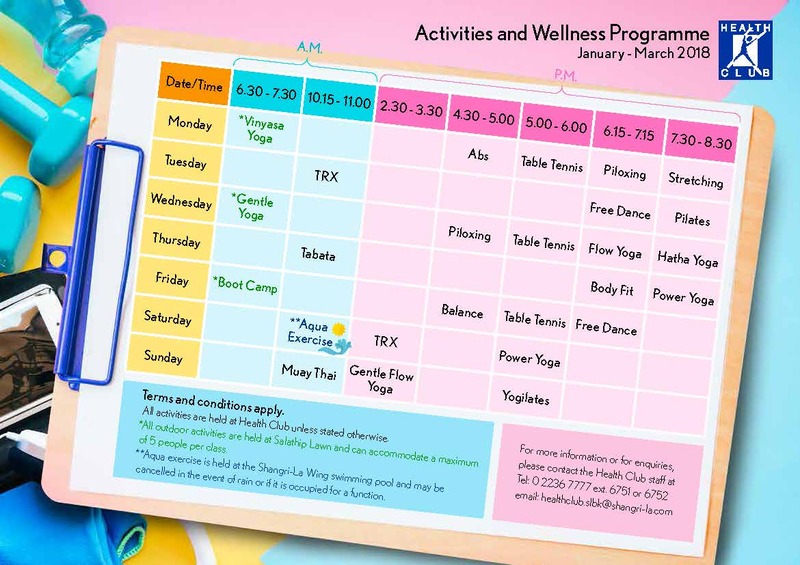 A selection of group fitness classes, taught by seasoned instructors, is designed to accommodate health enthusiasts throughout the year. Designed by Hospitality and Leisure Asia (HLA), one of the top interior design firms with offices in Hong Kong and Singapore, the new Health Club offers Pavigym sprung floor system, which is considered the best for indoor sports and physical training. The Health Club provides access to a tropical free-form swimming pool and a 25-metre lap pool. Separate wet areas are available that house a sauna, steam room, whirlpool and experience showers to enhance the blood circulation system. The changing area features hi-tech magnetic lockers in modern design with a durable wristband that is convenient and easy to use. Located on the third floor of the Shangri-La Wing, Shangri-La Hotel, Bangkok’s Health Club is open around the clock, with personal trainers on standby from 5 a.m. to 11 p.m.